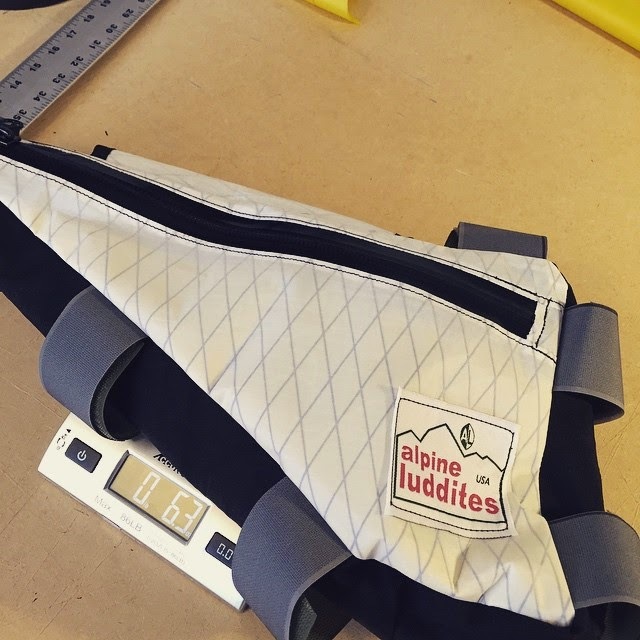 Alpine luddites frame bag. 6.3 oz , 178 grams. 1000D X pac fabric for abrasion on the frame, 200D X pac for the body panels. #8 YKK Utrek water resistant zipper. More Velcro than I like but this won't move once it's on. one inside flat pocket for maps. I added a square leather lash tab to the front of the bag for a removeable head tube strap if needed.The strap isn't shown in the picture. there is enough room in the "nose" of the bag, with a full 4L bladder, to fit 1200 calories of bars. this is a small frame, 15", so this is the smallest hardtail bag I could see building. bigger frames will require removable internal baffles or dividers to keep it from bulging outwards. I would also consider adding a second vertical zipper. a 2nd zipper isn't necessary on my bags if you place seldom needed items below the bladder/ top compartment. one zipper saves weight too. the dividers can be velcro or #5 YKK coil zippers. I prefer zippers as they don't grab clothing, are stronger and cleaner to use. cost is the same. frame bag with 4 L msr bladder weighs 12.6 oz. inside flat pocket is right under the zipper . Total weight of 4 bottles and cages is 24 oz empty ( 3 SS king cages and 1 salsa anything cage, 4-24oz camelbak bottles) and that is still less water carrying capacity than the lighter bladder/frame bag combo....So I save 12 oz. thats huge. Not that i will need to carry it full all the time but if I need to it's nice to have the option. I could have left offf the second label to save more weight. frame bag with a 4 L MSR bladder inside.